If you are looking for information on the Norwalk Furniture Idea franchise business opportunity, Norwalk Furniture franchises or Norwalk Furniture store franchising, then you have come to the right place. For more than 100 years, we've helped furniture shoppers create something unique. Since 1987, we've done the same for our franchisees. Our philosophy is simple: Create stylish, one-of-a-kind upholstered furniture in an intimate, service-oriented retail environment. 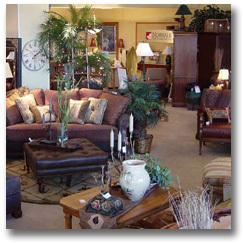 That means a low-inventory investment for you and an extraordinary selection for your customers. It's this one-of-a-kind furniture store concept that makes our nearly 80 Norwalk Furniture Idea stores a growing success and the right concept, at the right time. "It's been over five years since we opened our Norwalk store, and we've gone from knowing nothing about the furniture business to buying our own property and building our own building. I'd tell anybody interested in opening a Norwalk store to go for it. The training is great and the system works. It's paid off for us." "I really feel like the factory is an extension of our team. It's kind of like the advertising [says] ... 'being in business for yourself, but not by yourself.' That's really important to me." "The Norwalk team really devotes a lot of time to being sure that you get started off right and they've been with us every step of the way. I would tell anybody thinking about getting into the business to really research other companies and compare. When you do, you'll see that Norwalk really has the style, the look and the quality, and they really do what they say they are going to do." "I'm not a furniture industry veteran, but from what I know about retail and my market, there are a lot of people who talk about providing custom furniture and few who do it. When you get right down to it, we really are a custom-order, catalog showroom. We don't sell anything off the floor and we focus very heavily on our core product. Those two things set us apart from every other store in our market." "Even though Norwalk is a big corporation, you never feel like you're alone because they are with you from the beginning - from site selection all the way to merchandising and procedures." "Some might think that 'family' is an unusual way to refer to a company and its franchisees, but people often tell me that one of the most important aspects of working with Norwalk is the deep sense of community they experience. They come to us looking for the support that aligning with an organization like ours offers. Once on board, they find others they can relate to ... people who become not only trusted colleagues, but good friends."